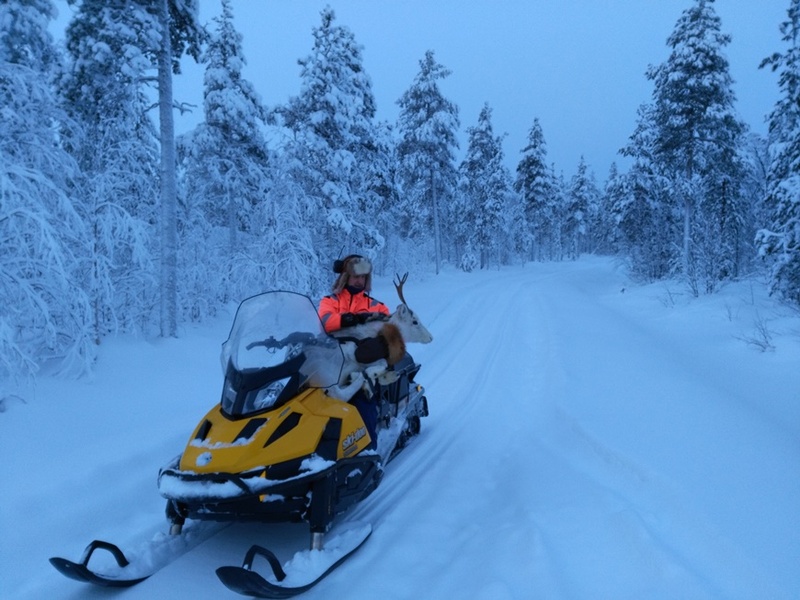 We visited a small Kierinki village in Finnish Lapland at the beginning of January. Kierinki is located in the municipality of Sodankylä in Northern Finland. We had visited Kierinki once before, but at that time the weather was extremely cold, almost -40 degrees Celsius. This time the weather was on our side. We were very happy about it because we could get to know the small Lappish village even better. We visited Kierinki during a polar night season ("kaamos" in Finnish) when there are only a few hours of daylight. We got a warm welcome from Teija Raaterova, who has played a key role in revitalizing this small village - together with her fellow entrepeneur Paavo Holopainen, and other active people in Kierinki like Airi Kangas and restaurant entrepeneur Pekka Hakola. In Kierinki you don’t see large number of other travellers, and that is one of the reasons why we like Kierinki so much. In Kierinki you have a chance to be in peace and spend your vacation at your own pace or in activities with the locals. Kierinki is also a very snow-sure place in Finland. The heart of the village is Kierinki Shop & Cafe, re-opened in 2011. The shop offers a wide range of services: groceries, fishing permits, as well as local art and souvenirs, not to forget a restaurant that offers breakfast and lunch. There is also a petrol station in connection with the shop. There are different kinds of accomodation alternatives in Kierinki: a brand new guesthouse, opened in Christmas 2016, holiday apartments, Grandma Cabins, a caravan area and a tent village. We stayed in one of the cosy holiday apartments. It is a good choice for families with children. The apartments have a private sauna, kitchen and lounge, and they are equipped with bed linen, towels and kitchenware as well as a TV. The charming and traditional Grandma Cabins are popular during the summer. Places to stay are needed, as there are annual popular Lappish events taking place in Kierinki. The Theater Festival is held in July and the Rural Market, with merchants from all over the Lapland, is held in the first week of September. A special thing about Kierinki is that guests, if they want, have an opportunity to experience activities truly together with the locals. We sat down on a sleights pulled by snowmobiles and went to check the fishing nets on the frozen Miskisjärvi lake together with Teija, Airi and Esko. Along the way we stopped by one of Kierinki's reindeer farms. There were not only a couple of reindeers, but there were dozens of them. It is important to walk calmly at the farm, because the reindeers are quite sensitive. We had a chance to feed them together with the owner. The kids were excited. We continued our journey to Miskisjärvi lake where the first nets were. Unfortunately, we didn’t get any fish from there, but luckily Esko and Airi had nets also in Riipijoki river, right next to the village. And then it finally happened, we got a huge pike! At the end of the day we sat down by the open fire and grilled some sausages. The trip was a thrilling and relaxing experience both for children and adults! The rates are minimum 2 full paying adults. Children with 2 adults -50%. Before returning home we still wanted to enjoy the snow and at the same time test Kierinki’s cross-country skiing tracks. The weather was nice, the sky was bright and the temperature was -5 degrees celsius. The sun was still not visible, but the sky was full of beautiful colours. To get to the skiing track, we had to drive 1 km of Raaterovantie. The track that leads you near the border of Kittilä municipality can be found on the left side of the road. What a pleasure it was to ski in all the silence along the track surrounded by snowy trees. Because of a flat terrain, it was nice to ski, especially with children. If you do not have your own sled with you, you can borrow it from the Kierinki Shop & Cafe or from the Guesthouse. Kicksleds can also be borrowed freely. In Kierinki you have also a chance to get acquainted with the highland cattle. The animals seem calm and are eager to come to you if you've got bread with you to taste. However, be careful when feeding the cattle. On arrival, the animals came so enthusiastically to us that it felt like the fence almost crashed. So we continued feeding by throwing the bread for them. Highland products can be purchased at the Kierinki Shop & Cafe, or they can be enjoyed at the restaurant. Kierinki brings us warm memories, especially because of the friendly people. We felt welcome and we found Kierinki more fascinating than a year ago due to the longer visit. The Polar night period (Kaamos) brought its own spice to our visit. A headlamp was one of the most important tools during our visit. It was great to be able to see and experience the winter activities of Kierinki - winter fishing and reindeer feeding. According to our children, the best part of our holiday was sitting on a sled pulled by a snowmobile. That really is something different than at home. Eetu (6 years) also liked our nice "cottage" there. It was surprising that there's so much to experience in Kierinki. "Although Kierinki is located in the middle of nowhere, from the village it is easy to go for a day trip to skiing resorts like Ylläs, Levi or Luosto, or to the capital of Finnish Lapland, Rovaniemi. All of them are slightly over one hour's drive away by car."